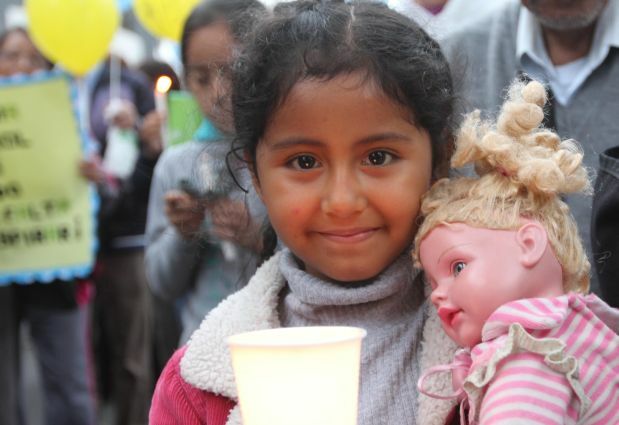 LIMA, Peru (CNS) — Dwarfed by the grown-ups holding banners and signs around her, Ruby Arizabal clutched a doll in one hand and a candle in the other. The 6-year-old was one of the youngest participants in an interfaith candlelight march and prayer vigil on the eve of the U.N. climate summit, which will run from Dec. 1 to 12 in this city of 9 million people that sprawls across Peru’s coastal desert. The summit is seen as a crucial last step on the road to a new international treaty to curb emission of greenhouse gases, which a new U.N. study says could push global temperatures to dangerous levels by the end of this century. “We don’t just want promises — we want them to be put into action,” Elias Szczytnicki, general secretary of the Latin American and Caribbean Council of Religious Leaders of the World Conference of Religions for Peace, told the marchers. Development that ignores environmental impacts “will have very significant consequences for future generations,” he said. 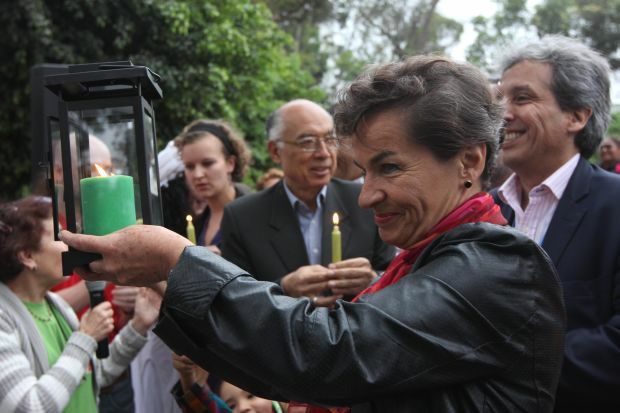 The vigil came at the end of a series of nine monthly interfaith days of fasting for the climate, said Laura Vargas, former executive secretary of the Peruvian bishops’ social action commission and one of the organizers of the fasts. “We want to pray and to show publicly that religious communities are aware of what is happening and are committed to the idea that we must reduce emissions and we must pressure our leaders,” Vargas told CNS. Besides the climate fast, vigil-goers said they had participated in other activities to raise environmental awareness in their communities. “We’re not behaving well toward the planet,” said Mendoza, one of more than 50 parishioners from Lima’s Santa Cruz Parish who have been studying about the stewardship of creation and spearheading campaigns to clean up their neighborhoods and promote recycling. During the 12-day summit, negotiators will try to finish drafting an agreement to reduce greenhouse gas emissions and help countries adapt to climate change. The final version, to be approved in December 2015 in Paris, would take effect in 2020. Past climate summits have bogged down in differences between industrialized and developing countries. Some observers are more optimistic this year, after the United States and China, the world’s two largest greenhouse gas emitters, jointly announced emissions-reduction targets, and more countries made pledges to the U.N.’s Green Climate Fund. Nevertheless, scientists with the Inter-Governmental Panel on Climate Change say bigger steps are needed to keep global temperatures from rising past the point at which irreversible changes are likely to occur. While the largest emissions in industrialized countries come from energy and transportation, deforestation is the main culprit in Amazonian countries, including summit host Peru. Environmentalists have criticized Peru for promoting production of oil — a major source of greenhouse gases — to help boost its economy. The country also made international headlines recently when four Ashaninka Indians were murdered on the border with Brazil, allegedly by illegal loggers. Peruvian Environment Minister Manuel Pulgar-Vidal has said he hopes the summit will raise Peruvians’ awareness of climate issues and lead to a greater push for climate-friendly energy and land-use policies. Religious groups must become “green congregations” and educate the faithful about “the urgent obligation to address climate change,” he said. Speakers at the vigil called on all men and women of good will, believers or not, to make personal decisions that are environmentally sound and that reduce their “carbon footprint,” which measures the use of fossil fuels. “When people begin to feel that the Earth is not something to be bought and sold, but is part of us, that if you abuse it, you are harming yourself, it creates a holistic relationship,” Vargas said. As candlelight flickered across the park just blocks from Peru’s army headquarters, where the climate summit opened Dec. 1, Szczytnicki thanked the vigil-goers for bringing “the light of hope” to the negotiations.